NETWORK FINALS: BIG BROTHER and the 8PM rerun of THE GOLDBERGS gained 0.1 in final numbers. CABLE HIGHLIGHTS: Bravo stayed at the top of a mostly upbeat Wednesday for cable, with REAL HOUSEWIVES OF NYC up a tenth to 0.62, and ODD MOM OUT steady at 0.21. On Discovery, ALASKAN BUSH PEOPLE jumped 0.18 to 0.60, and HOMESTEAD RESCUE ticked up to 0.34. OWN’s QUEEN SUGAR gained 0.03 to 0.47. Fox Sports 1’s coverage of the CONCACAF GOLD CUP was at 0.47, and Univision’s Spanish-language coverage was at 0.31. FX’s SNOWFALL had a 0.07 bump to 0.46. On MTV, CATFISH rose 0.09 to 0.46. On VH1, BLACK INK CREW was at 0.45. TBS’s FULL FRONTAL returned at 0.42. 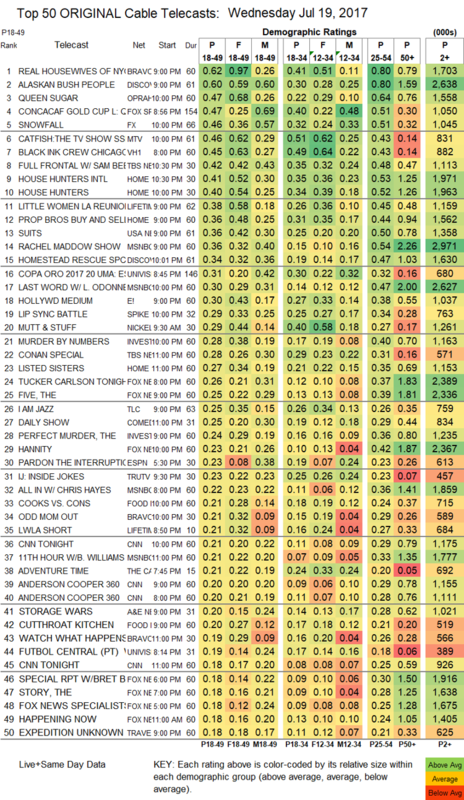 On HGTV, HOUSE HUNTERS INTL climbed 0.09 to 0.41, HOUSE HUNTERS flew 0.11 to 0.40, and PROPERTY BROS was up 0.03 to 0.36. Lifetime’s LITTLE WOMEN LA REUNION was at 0.38, a tick lower than last week. USA’s SUITS was steady at 0.36. It was another strong night for MSNBC’s RACHEL MADDOW SHOW at 0.36/3M, above Fox News’s TUCKER CARLSON TONIGHT at 0.26/2.4M, and CNN’s ANDERSON COOPER 360 at 0.20/1.1M. 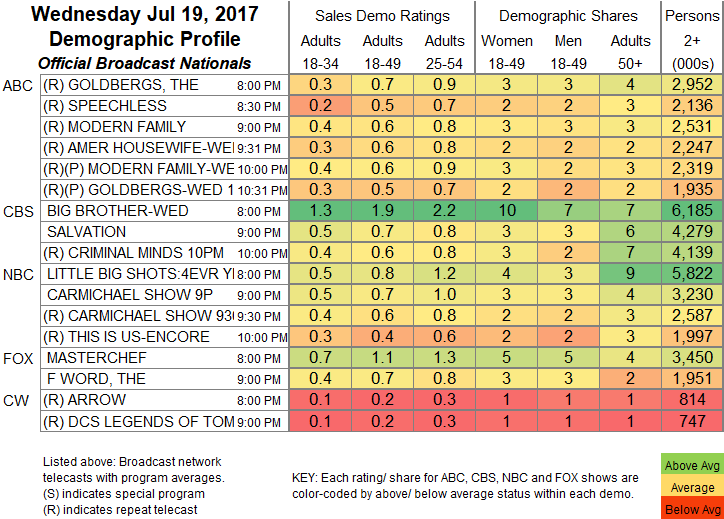 E!’s HOLLYWOOD MEDIUM was up a tenth to 0.30. Spike’s LIP SYNC BATTLE ticked down to 0.29. On ID, MURDER BY NUMBERS FELL 0.07 to 0.28, and THE PERFECT MURDER was down 0.08 to 0.24. On TLC, I AM JAZZ held at 0.25, and HAIR GODDESS was down 0.06 to 0.13. Food Network’s COOKS VS CONS lost 0.04 to 0.21, and CUTTHROAT KITCHEN ticked up to 0.20. A&E’s STORAGE WARS was at 0.20. TV Land’s YOUNGER was steady at 0.18. Tru’s INSIDE JOKES ticked down to 0.23, then I’M SORRY was at 0.15, after last week’s premiere 0.16/0.10. Comedy Central’s HOOD ADJACENT rose 0.05 to 0.14. Syfy’s BLOOD DRIVE lost a tick to 0.13. In the sub-chart group, BBCAmerica’s BROADCHURCH held at 0.04/256K, POP’s NIGHTCAP added 0.01 for 0.02/89K, and Sundance’s CLEVERMAN was also up 0.01 to 0.02/72K.